Though reports have suggested Apple's next iPhone will not support the 4G long-term evolution standard, AT&T will roll out its new high-speed network to more than 70 million customers by the end of 2011. Details for AT&T's 2011 LTE plans were detailed by the company's chief technology officer, John Donovan, in a post on his company's site. 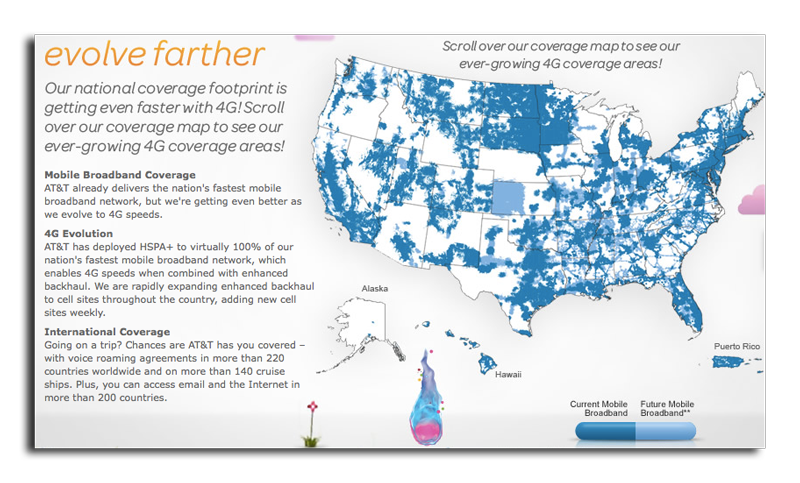 AT&T's 4G network will debut this summer in five markets: Dallas, Tex., Houston, Tex., Chicago, Ill., Atlanta, Ga., and San Antonio, Tex. "We plan to add another 10 or more markets in the second half of the year, and cover 70 million Americans with LTE by year-end," Donovan wrote. "We also have plans to add 20 4G devices to our robust device portfolio this year, with some of those being LTE capable." He revealed that AT&T has invested $75 billion in its wireless and wired networks in the last four years, more capital invested than any other company in any industry. AT&T also plans to invest $19 billion in wireless and wireline networks, along with other capital projects, this year. "The investments we've made to evolve our mobile broadband network in recent years, plus what we have planned for the future, put our customers in position to benefit fully from a host of coming mobile broadband innovations," he wrote. The launch of AT&T's LTE network will come well after rival Verizon, which debuted its fourth-generation high-speed network last December in 38 metropolitan areas and more than 60 commercial airports across the U.S.
AT&T has been hyping its forthcoming LTE network, and last week showed off download speeds of 28.8Mbps, along with 10.4Mbps uploads. The download rate is more than seven times faster than the 3.77Mbps rate that can be reached on AT&T's current HSPA network, while uploads were more than eight times the current 1.21Mbps rate. Verizon says its LTE network has real-world data rates of between 5Mbps and 12MBps downstream and 2Mbps to 5Mbps upstream. Verizon's LTE network will be nationwide by the end of 2013, while AT&T has said its own LTE deployment will be "largely complete" by the same time. Recent rumors have pegged an LTE-capable iPhone to come from Apple in 2012, and not this year. Verizon's chief executive said earlier this year that Apple understands the "value proposition of LTE," and that they will be "a part of" the technology's future. At the official Verizon CDMA iPhone 4 unveiling in January, executives revealed that Apple chose not to include LTE technology because it would require design changes. Officials from Verizon indicated they wanted the iPhone as soon as possible, so Apple obliged with a modified version of the GSM-based iPhone 4 released in 2010.